What Responsibilities Can A Caregiver Help With After a Hospital Stay? When you get ready to leave the hospital after a surgery or illness, you may still have a significant amount of recovery ahead of you. Even if you stay in a rehab facility for a week or two before going home, it probably won’t be as easy to get around on your own as it used to be, at least for a while. Home care eases the transition by offering support where you need it so you can continue to enjoy your independence at home. How Can a Caregiver Help With Your Recovery? When you return home from a hospital or rehab stay the transition may be difficult, especially if you still experience weakness or pain. Routine tasks like doing laundry, cooking meals, and even getting in and out of bed may be difficult to manage. A caregiver helps meet these daily needs by assisting you with tasks like housekeeping, meal preparation, keeping the refrigerator stocked and making sure you have clean clothes to wear. They can also make your continued recovery easier by helping with personal care, daily hygiene, and mobility. 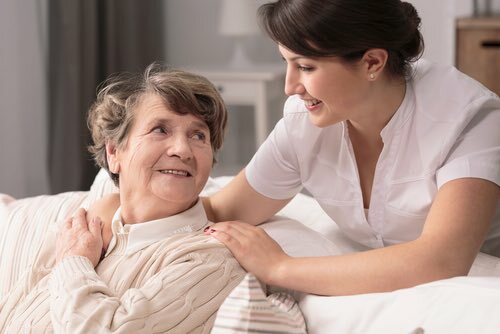 But perhaps the most important way you benefit from working with a caregiver is the peace of mind you have in knowing someone will be there to take care of the many daily responsibilities that would otherwise seem overwhelming. What Responsibilities Will a Caregiver Perform? In addition to the physical needs of recovery, many people struggle with loneliness and depression when they are confined to the house after a surgery or illness. These conditions can slow down your recovery time and contribute to decreased overall wellbeing, but companionship can help. When you’re feeling lonely or just bored, having someone to talk to can make a huge difference. You may also enjoy the mental stimulation of playing games or doing other activities with your caregiver. The best time to plan your transition home after a hospital stay is before your surgery. If you have been hospitalized due to an illness or fall, talk with your family or your doctor about how to create a plan well before it’s time to head home. That’s the best way to make sure you have the right support network in place so you’ll be able to focus on your health. Do you have more questions about how home care can help you after your hospital or rehab stay? Please give us a call at 440-484-5390.